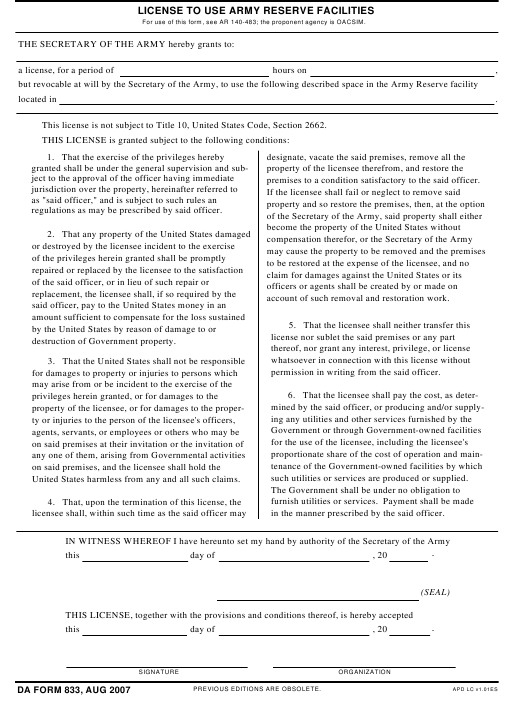 DA Form 833 - also known as the "License To Use Usar Facilities" - is a Military form issued and used by the United States Department of the Army. The form - often mistakenly referred to as the DD form 833 - was last revised on August 1, 2007. Download an up-to-date fillable PDF version of the DA 833 below or request a copy through the chain of command. For use of this form, see AR 140-483; the proponent agency is OACSIM. This license is not subject to Title 10, United States Code, Section 2662.
premises to a condition satisfactory to the said officer. regulations as may be prescribed by said officer. account of such removal and restoration work. permission in writing from the said officer. such utilities or services are produced or supplied. United States harmless from any and all such claims. in the manner prescribed by the said officer.